The stunning image of billowing clouds and shimmering colors is impressive in more than just the aesthetics. Taken by the Hubble Space Telescope, the pink fireworks seen bursting across the picture are all stars forming in the aftermath of a massive cosmic collision between two galaxies some 24 million light-years from Earth. Despite gravity being, fundamentally speaking, a pretty weak force, it still has the ability to shape the universe. Over a course of millions of years, it has caused two galaxies next to one another, the vast NGC 4490 and it’s more diminutive neighbor NGC 4485, to come slamming into each other. In the process of this immense impact, stars are formed. The smaller of the two galaxies was trapped in the grip of the larger one’s gravitational forces, sealing their fate as they danced around one another until the inevitable happened. The picture seen here is a snapshot of just after the almighty collision, after the two galaxies collided and then passed through one another.The result is a complete altering of NGC 4490’s shape, with it having been pulled and stretched to such a degree that it has now been nicknamed the Cocoon Galaxy, as all traces of its once spiraled structure has been obliterated. 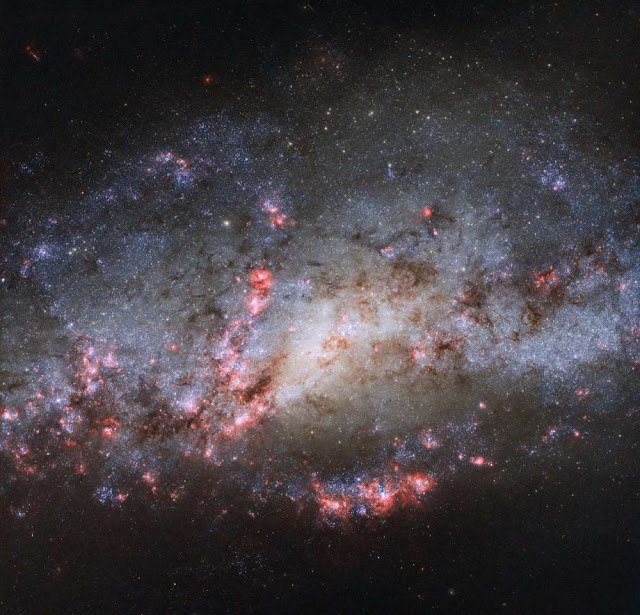 Its companion galaxy, NGC4485, which cannot actually be seen in this image, has however managed to retain its spiral arms. As the two galaxies hit each other, the dust and gas swirled together under massive pressures creating the conditions ripe for star formation. These rippling patches can be seen in glorious pinky hues of dense clouds of ionized hydrogen. The newly created young, hot stars have been showering these patches with ultraviolet light, irradiating them and giving them their glowing appearance. When both NGC 4490 and NGC 4485 are seen together, a thin thread of newly forming stars some 24,000 light-years long hangs between them, tracing the path the two made as the galaxies passed through one another.Yet as stars are formed, others will die. Within NGC 4490, despite it now being known as a starburst galaxy in light of the innumerable stars being born and beginning their lives, there are also a handful of supernovae, as others are dying and coming to the end of theirs. But this dance does not end there. The fate of NGC 4490 and NGC 4485 are intrinsically linked, as in around a billion years gravity will once again force these two galaxies to meet once more in a yet another magnificent cosmic clash.